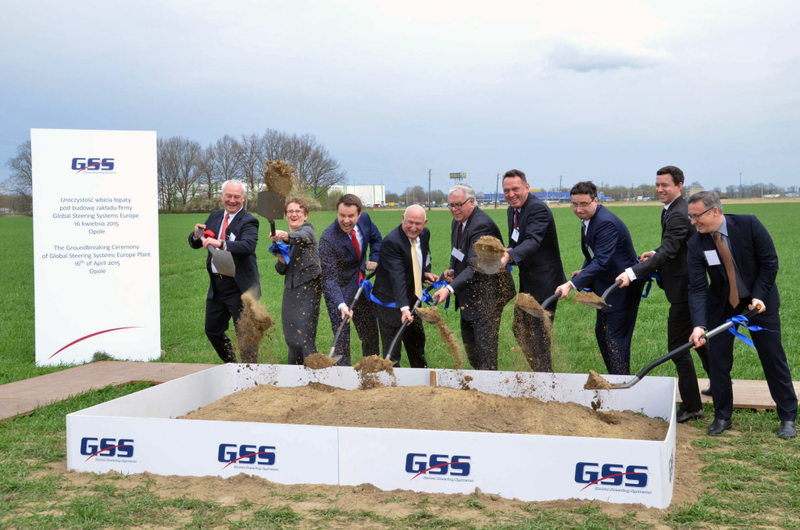 GSS begins construction in Opole - WSSE "INVEST-PARK". Wałbrzyska Specjalna Strefa Ekonomiczna "INVEST-PARK". - We are going to be a model investor, one who is involved in the local community, cares about the employees’ welfare and our business partners – said GSS Europe CEO Larry Finnell at the ceremony of launching the investment. Global Steering Systems will build a manufacturing facility within the Wałbrzych Special Economic Zone in Opole. The American company has declared to hire at least 200 employees and invest around 27 million zlotys. GSS is a manufacturer of steering system components. The cutting-edge technology used by the corporation ensures best performance results in its class. This is the second stage of the company’s expansion outside the US. Global Steering Systems has recently launched a factory in China, and it is building a plant in Brazil at the same time as the one in Opole. - We have been considering locations in Romania or Spain. However, we came to Poland three years ago and visited a factory that produces components similar to ours. We were hugely impressed by the employees’ work ethics, their involvement and qualifications. Thus we knew that we wanted to invest here. The choice fell on the Wałbrzych Zone in Opole because we were welcomed with open arms and we could count on help with all formal issues – Mr. Finnell said during the ceremony. The construction will begin in May and last until October. The recruitment of new workers will start this fall. Production is scheduled to being in early 2016. - We feel honored by this decision to invest within our zone. It is also the best choice for the investor. There are currently 170 companies in the Wałbrzych zone, and 40% of them are companies from the automotive industry. I am convinced that GSS will become an important part of this system – said during the ceremony Barbara Kaśnikowska WSEZ “INVEST-PARK” President. In Opolskie Province, the Wałbrzych Special Economic Zone currently covers 486 ha of land that provides entrepreneurs with tax exemptions. At present, 23 firms are operating here, including six that are connected with the automotive industry.